K: From Wall Street, this is Killian Brandon, Senior Analyst with the Wall Street Reporter. Our company in focus today is Cincom Systems, founded in 1968. Cincom is one of the largest international independent software companies in the world. Headquartered in Cincinnati, Ohio, Cincom Systems is privately held. We’re very pleased to be joined again now on the line by the company’s founder and Chief Executive Officer, Thomas Nies. Mr. Nies, good morning, and thank you for joining us again at the Wall Street Reporter. TN: Good morning, nice to speak with you again, Killian. ­­­­K: We’d like to start off today by really looking at the industry that you’re focusing on. Perhaps you can give us your take on the current industry trends and how Cincom is positioned. TN: Well, the software industry overall has been around for almost 40 years Killian, and the great organic growth in the industry, I believe, is behind us. From a total prospective, that’s not to say that there aren’t some new market segments that are developing that could become very big in the future, but most of the areas that have seen the superstar, mega companies grow are now pretty much super saturated, and as a result, the organic growth for very large firms is very, very limited. And so most of them are looking to consolidating the industry and buying more and more software companies – not only to grow their revenues, but also to give them economies of scale and maybe even some innovation that they could pump into their companies through acquisition. I think that bodes very well on the smaller and medium-size company. Even the medium-large have become targets then for acquisition because the big companies with lots of money must buy to grow revenues. At least that’s what the last three to five years seem to confirm. K: What are some of the key drivers in the market? What do you see leading to demand in terms of the specific areas that Cincom focuses on: customer communications, data management, application development, and hosting? What are the drivers within these areas? TN: Well the key driver is innovation – better, faster cheaper ways to do things – and the innovation that will simplify the work and provide much bigger value to customers. This is a major opportunity again for medium- and smaller-size companies that do not already have very large customer bases. Because the large companies are somewhat limited on the innovation that they can bring into the market, which obsoletes their current customer community and reduces the prices that people would be paying for software. So the innovation I think provides a great opening for medium- to small-size companies, and there’s a lot of money available for people who want to improve technologies and to improve themselves. I think we’re seeing how fast new companies can grow. One example would be Google. It is one of the biggest brands in the world today, and it’s less than 10 years old or so. But there are other examples. VMWare went public yesterday, and I think they had, the first day the stock price soared up something like 50 to 60% of the initial offering price. And that was when the stock market was getting clobbered. So medium- and smaller-size companies that have good growth potential I think are very attractive. K: In terms of geographic focus, Cincom has a majority of its business outside the United States. Where do you see the growth areas internationally? TN: Well again, America and most of Western Europe are again super-saturated markets. They’re rich; they have a lot of money, a lot of buying power, and a lot of big corporations. But they also have bought a lot of software over the last 10 years. The opportunities are in the emerging developing markets. China for example, India, South Korea; the whole Pacific Rim. Japan, I think, is still a very good market for growth. And Eastern Europe will become a good market in the future. The BRIC countries – Brazil, Russia, India, and China – is where I think probably 70 to 80% of the growth in the next 10 years will occur. K: Now you mentioned the global arena. What are some of the new industry verticals that you see an opportunity in? For example, do you see a resurgence of interest in the telecom sector? TN: I do indeed. And the reason for that is that companies are trying to get closer to their customers at the same time that they’re reducing the cost of selling. And so, using the internet, using telephonic interaction, and so on is a big item. So anything that deals with using mass means of communication with customers and selling it, distributing, and so on is a big opportunity. Google is an example of that, but so is e-Bay and others who have found ways to use the internet and leverage that to their advantage. All companies are looking to do that today. So software, which facilitates that, I believe, is a great growth opportunity. It’s where we’re putting pretty heavy bets. K: Now you mentioned Google putting pretty heavy bets. You’ve increased your R & D capacity in recent times. Tell us more about that. TN: Well we’ve not only significantly increased our capacity in R & D, but we shifted the emphasis in our company from being about 12 to 13% of our total expenses investment to not be over 25%. And the reason we’re doing that is because we believe that better technology – if we can communicate and sell that using the internet and the web – will enable us to reduce the amounts of money we have to spend on sales and some of the other cost overall in the company. In the past, direct selling was a big, big expense for us and for most of the companies that grew their software business. I think now, and in the future with more sophisticated buyers, customers are more aware of the value and the potential that the software offers. If you can bring this to their attention through internet marketing, webcasts, and other means – trial offers and proof projects for customers using the software themselves, etc. – that if the software is really good, it will sell itself. We want to let the products shine in the eyes of the customer, so we’re putting a lot of money into R & D to create technology that will be very, very appealing. K: Well you mentioned earlier about how the market has become somewhat saturated in recent years. How has the overall competitive environment changed as a result of this, and how is Cincom differentiated from perhaps some of your larger competitors? TN: We’re trying to move as rapidly as we can away from the markets of the past to the markets of the future. For example, ERP systems. There’s not a manufacturer in the world that doesn’t already have an ERP system installed. Yet ERP systems are a significant portion of the revenue of companies like Oracle, SAP, and others. So they are having to move downstream to smaller-size companies. But the smaller-size companies aren’t willing to pay the huge prices that the mega companies will for software. That means that for those markets, even where there are possibilities for growth, the profitability may not be there. So we’re trying to move our investment into the markets that are not already heavily saturated, not really fully developed, and yet are eager to look at the new technologies. I mentioned some of those earlier, but document management and document preparation are other areas where there are gigantic savings for companies. And it’s a market space that’s very, very big, but it’s hardly even touched on. So it’s another market space that we’re moving into. Finally, I would say that the big emphasis in our company is moving beyond information technology to Knowledge Management. Knowledge Management is where we’re staking our future. And by that I mean allowing companies to build, develop, and concentrate their intellectual capital and use software to lever that. So that’s what we’re trying to do as a company. K: One market, where historically technology perhaps hasn’t been adopted as quickly, would be the health care sector. Is that an area of particular opportunity for Cincom? TN: The health care sector is one of the three major markets that we’re trying to develop new markets. I would say 35 to 40% of new business we’ve sold in the last year or so has been in the health care segment. We believe it’s a big market. It’s a growing market. So, health care is a target market for us – a major target market. K: As part of your overall strategy, how important are partnerships and alliances for Cincom? TN: Well that’s the second part of our strategy. We were primarily a direct seller in the past, but over the last couple three years, we are moving heavily to partner with some allies who will provide sales, service, and support for the products we offer. That’s why we’re moving our emphasis so heavily into R & D so that we can bring a large number of partners very, very good technologies that will win, with a minimal cost of sales. They can make a lot of money in selling those products, they can sell services and they will become a partner. Over the history of our company we’ve generated about 20% of our revenues through partners. Our objective is before this decade is out, to generate 80% of our new business sales through partners. K: Now as part of that overall partner strategy, would you also look perhaps to partners in the investment community to further your objectives? TN: We most certainly would and we are interested ourselves in finding good technologies or smaller companies to buy. Being a private firm, we don’t have a lot of capital aligned for this purpose. But most small, medium software companies – I would say this, 99% of software companies – are really up for sale to the right buyer. And a lot of them have big potential. Those small, medium-size companies – which I mean companies between 10 to $50 million in revenue – are looking to cash out. They don’t want to take shares in other companies. And so investors who are willing to put out cash to help us buy, become partners in those acquisitions, from our standpoint, would be very welcome. We would provide marketing, distribution, other technologies, and partner alliances that could leverage those products of most companies that we buy. Some efficiencies, some economies of scale that are marginally profitable, cash-starved companies could really be turned into pretty nice pieces of business. So it’s doing what Oracle, SAP, Microsoft, and IBM are doing, but we’re doing it at the lower end of the industry versus trying to buy bigger companies. A company like Oracle let’s say – if they’re going to buy a software company, they’re not interested in a 20, 30, 40, or $50 billion company – that means absolutely nothing to their revenues. They’ve got to buy a $500 million or a billion-dollar company to have some impact. So we have a similar strategy. And, we would embrace partners, financial partners, in those efforts. K: Well finally Mr. Nies, before we conclude today, perhaps we could recap your ­­­thoughts and outline some of the key milestones that those interested parties should look to with Cincom over the next 12 months. TN: Milestones of the kinds of things that we might be talking about? TN: Health care is an area that we’re hoping to grow rapidly. And document management, document systems is an area in which we have a big interest. Knowledge management, consolidating intellectual capital, and helping customers interface personally with their customers to help them to grow their businesses successfully. And then finally everything to do with the internet, call centers, customer relationship management. These are four key areas of growth for us. We hope to have the continuation of growth in areas like manufacturing and so on, but we look for much slower growth rates in those particular markets than in the others that I just mentioned. K: Certainly a very compelling story. Cincom – a company to continue to follow here. Mr. Nies, I’d like to thank you indeed for joining us today at the Wall Street Reporter. TN: Thank you very much, it’s nice to talk to you again and best wishes for every success and happiness. K: Our guest today was Thomas Nies, founder and Chief Executive Officer for Cincom Systems. 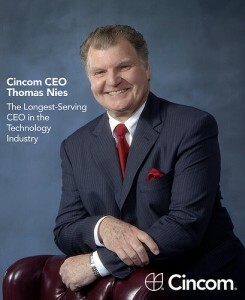 Cincom Systems is privately held, and further information can be found on the company’s website at Cincom.com.